Do You Have Home Care Questions? We've Got Answers. Below are answers to commonly asked questions regarding working with Central Penn Nursing Care. "Just your presence was a comfort." Q: How can I arrange for Central Penn Nursing Care to care for my loved one? A: Contact our office and one of our scheduling coordinators will assist in determining your needs and schedule a free Nursing Assessment. Q: How do I know what level of care is best? A: Our scheduling coordinators will explore the needs of your loved one, helping to determine what level of care is best. We offer many levels of caregivers. Q: What kind of services can a caregiver provide? A: Caregivers can help with many things – light housekeeping, meal preparation, laundry and errands. “Driver approved” caregivers can take you to scheduled appointments (hairdresser, doctor, etc.) 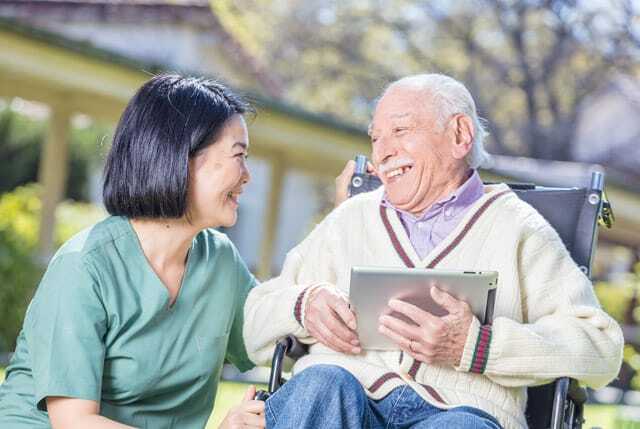 and our Nursing Supervisor will develop a Care Plan that outlines personal senior care needs (bathing, dressing, medication supervision, etc.). We’ll ensure that your loved one is comfortable in their environment. Q: How is a caregiver selected? A: We carefully screen our caregivers and strive to match the requirements of the client with each employee. We consider personalities, skill set, travel distances and schedules. Q: What if my loved one’s care needs change? A: We are always flexible and easy to work with, realizing that the needs of the client may change for a variety of reasons. Because we offer all levels of care, we can increase or decrease our services depending on the individual needs. Q: What if I don’t feel comfortable with the caregiver? A: We strive to exceed the expectations of our clients. If you’re not comfortable with a caregiver, we will find a replacement that you are happy with. Q: How is the caregiver paid? A: All caregivers are employees of Central Penn Nursing Care and are paid on a weekly basis. We cover all insurance and social security for the caregiver. Q: How is the client billed? A: We typically bill weekly but can customize a schedule to best meet your needs. We accept Visa, MasterCard and Discover credit cards as well as direct bank draws for payment. Q: Does Central Penn Nursing Care accept insurance payments? A: YES. We accept assignments of benefits for long-term care insurance and will directly bill the company for you. Q: Can I reach you before or after regular business hours? A: YES. We have a Nursing Supervisor and Scheduling Coordinator available 24 hours a day, 7 days a week. Q: Do you have any job opportunities? A: YES! We’re always looking for qualified, caring and committed employees, and there are many benefits to joining the CPNC team – CLICK HERE to learn more. Can’t find the answer you’re looking for? Please call one of our offices or complete our online contact form.